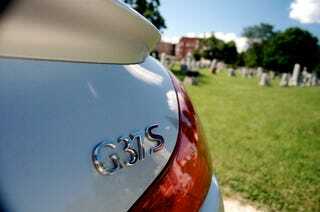 Why you should buy the 2008 Infiniti G37S: You've just been made junior partner at your law firm. You want to go fast, but you don't necessarily need to go the fastest. You want a car that handles well, but it's not like you're going to autocross it. You care about looking good but could care less if you look tough. You've got some change, but you don't want to spend all of it on a car. Why you shouldn't buy this car: You've just been made to chug a pitcher of Spaten Lager after being unable to name all the goalies of the previous four German World Cup teams. It is important that you be the fastest. It is more important to you that a car feels right than looks good. Price is no object. Well... price is an object, but you're willing to spend a little more and eat sugar packets for a week to get automotive perfection.